One of the elements for me of moving towards an unprocessed life was converting the meats I eat to organic, pastured versions. 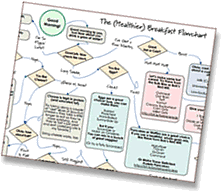 At the time of my epiphany of how tainted our meat supply was, it seemed like an fairly easy transition, and I couldn’t believe how bamboozled I had been by the manufactures of the meat I had been eating. So many of the bloggers I followed advised, “know your farmer.” I completely agreed but actually knowing your farmer was a little more difficult than I counted on. During my search, I came across a small Southern California family farm, Primal Pastures, who were featured in the recently released documentary Revolution Food Movie. They made the transition to meat raised on pasture so much easier. Once you actually meet your farmer, hear their story of why they do what they do, and see how the animals are treated humanly, the confidence in your food increases dramatically. If you live in Southern California, the trip there is well worth your time if you are in the midst of converting to a cleaner meat. Their Pastured Beef Chorizo is what gave my Fall Fiesta Sweet Potato Soup such a wonderful base flavor. For another recipe using Primal Pastures meat, check out my recipe for Roman Pesto Pasta. My favorite element of eating unprocessed is coming up with recipes that utilize the rainbow of colors. I love the level of nutrition that comes from colorful arrays and there is something so satisfying when your food is visually appealing. 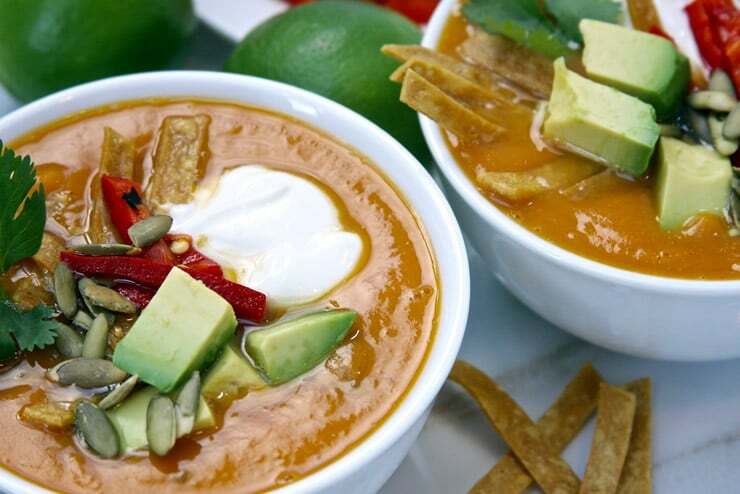 The bright sunshine of the sweet potato and roasted red pepper coupled with nutty creaminess of the avocado and pepitas makes this soup an absolute fiesta for the eyes and taste buds alike. This is taking comfort food to a whole new level. I feel a secret to flavorful, unprocessed cooking is herbs, spices, and of course garlic. I don’t know where I would be without my garlic and nothing beats the aromatic smell of it cooking. Garlic coupled with chipotle, cumin, and coriander gave this Fall Fiesta Sweet Potato Chorizo soup a beautiful warmth. Just be careful with the chipotle if you are not big on heat. 1/2 teaspoon of organic powdered chipotle will provide an ample amount of heat for delicate taste buds. One additional topping that I used was organic plain Greek yogurt thinned with fresh lime juice. The yogurt counteracts with the heat of the chipotle for anyone who is a little more sensitive to spice and adds an extra layer of zestiness. 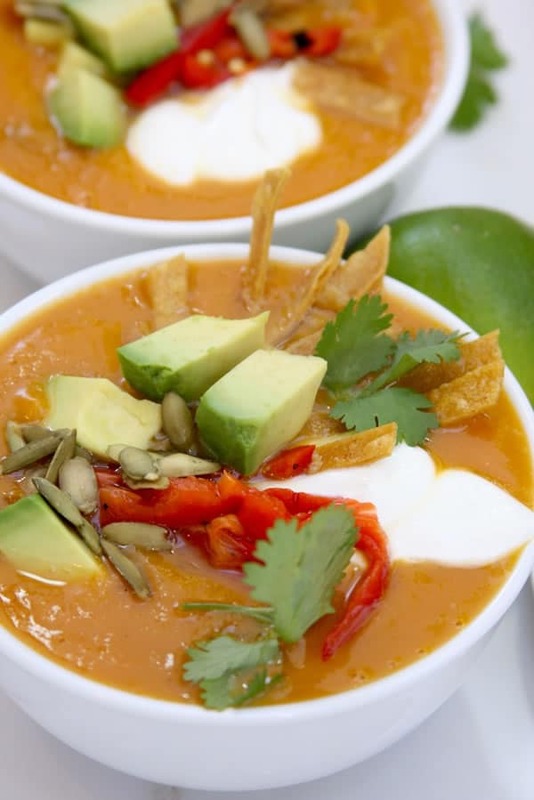 May this Sweet Potato Chorizo Soup recipe warm your chilly Fall evening and bring you one step closer to going unprocessed. Enjoy!! While pan is still hot add diced onion. Sauté until caramelized. Add coriander, cumin and chipotle towards the end of sautéing and heat for 1 addi-tional minute. Deglaze pan with about ½ cup of chicken broth to ensure all spice flavor is picked up. Add to potato stock pot. Bring to a boil over high heat. Cover and lower heat to med/low Cook for approximately 45 minutes or until potato is extremely tender. Juice the limes and add at the end of cooking process. Turn off heat. With an immersion blender, blend until smooth. Add cooked chorizo and warm soup over medium heat until desired temperature. Heather Vander Wey believes food should be soul-satisfying while helping you to feel like the best version of yourself. She loves nutrition and what food can do for you, and is excited by the grassroots effort of cleaning up our food system. Heather shares flavor-filled recipes at The Fed Up Foodie, and you can also find her on Facebook, Pinterest, and Instagram.